“School is the passport to the future, for tomorrow belongs to those who prepare for it today”. Schools set the base or a root of every child and it is very important to put your child in the best school in Jaipur, so that they get the best education along with ample amount of opportunities. Jaipur is a developing city with an increase in education level and standards. Education in the schools in Jaipur is reaching great heights and maintaining good standards by giving or providing everything which a child should get in terms of education, personality development and overall development. Education doesn’t only mean studies, but also enhancing the child’s growth and development where they themselves excel in different fields. Jaipur is developing towards being an educational hub. In Rajasthan, best schools are working day and night to achieve and give their best to children. 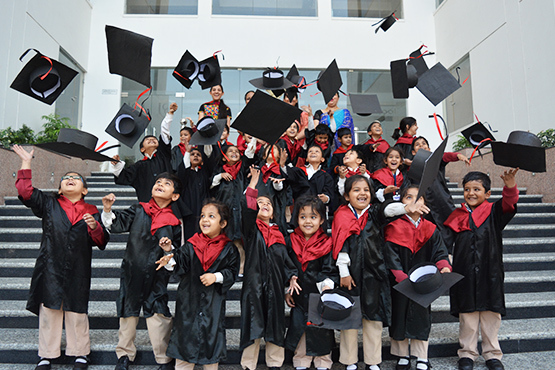 Amongst them, CAMBRIDGE COURT WORLD SCHOOL is termed as one of the prestigious schools in Jaipur. We practices various effective and innovative ways and methods which made its way to be among the best schools in Jaipur.. It highlights many things clarifies the purpose and learning goals and provides explicit criteria on how they can be successful giving EQ. Then there is classroom discussion in which the teacher steps offstage and facilitates entire class discussion. This promotes brain storming and effective learning. The most important method which our school follows is Metacognitive strategies. Metacognition is “cognition about cognition”, “thinking about thinking”, “knowing about knowing”, ‘becoming aware of one’s awareness”. Under this students are given opportunities to plan and organize, monitor their own work; direct their own learning and to self-reflect and evaluate. They become aware of their own knowledge and thinking taking up the ownership. Here stress is laid on how the child processes the information. Metacognition is basically coming up with new ideas and techniques to make learning easier for the children. Metacognitive learning is practiced in the school via Stem education and Case study classes making it one of Jaipur’s best schools. Auditory learners will remember information best by reciting it to the presenter while visual learners learn the best by visually looking at some interesting picture or movie ands on the other hand some learners learn by reading/writing meanwhile kinaesthetic learners will jump at the opportunity to participate in a hands-on activity. Cambridge Court World School caters to the need of all types of learners and makes sure that the message is reached to everyone in the room let it be any kind of learner, thereby being one of Jaipur’s best schools.